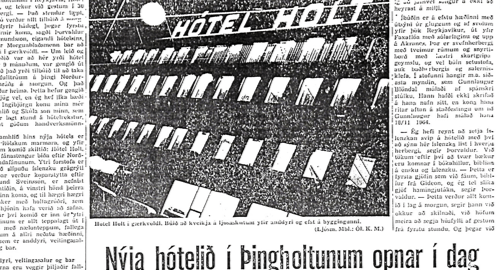 Þorvaldur Guðmundsson and Ingibjörg Guðmundsdóttir founded Hotel Holt in 1965. This harmonious couple took part in building and running a number of businesses in Iceland, in the food industry as well as the restaurant and hotel business. They loved travelling and used the opportunity when abroad to learn about the latest trends in hotels and restaurants to bring home to Iceland. Hotel Holt has from the very start been known in Iceland for the owners’ and staff’s cordiality and hospitality, as well as the unique collection of Icelandic art that adorns the building. Þorvaldur Guðmundsson opens the store Síld og Fiskur (e. Herring & Fish) in the building that now houses Hotel Holt. The product selection and quality were considered first-class and the store modern and stylish. Þorvaldur later founded a pig farm, still operating as Ali. 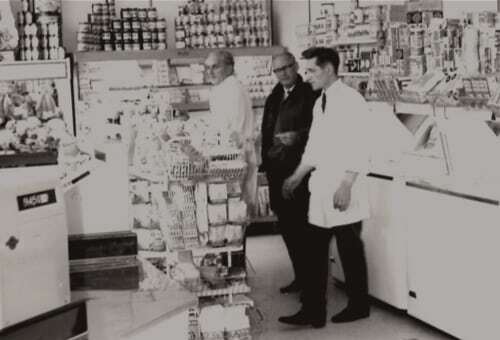 The butchers and store moved from Bergstaðastræti to Hafnarfjörður in 1980. The hotdog stand in Austurstræti 22 is opened, probably marking the birth of national fast food favourite: “one with everything,” a hotdog with the works. Getting approval for the hotdog stand proved problematic, since town authorities (Reykjavík was still a town back then) feared such novel catering would be unhygienic. They were proved wrong and the hotdog stand got its license with the condition that it would also sell newspapers. Newspaper sales were poor from the start since the papers were kept under the counter but the hotdogs became a big hit! Þorvaldur assumed management of Þjóðleikhúskjallarinn, the National Theatre bar, in 1951 and ran it until 1967. It was a popular place to dine before seeing shows in the theatre, but it was also used as a venue for public parties when foreign VIPs would visit. The bar’s New Years Eve party was a glamorous annual event. Guests were given porcelain trays with the evening’s menu inscribed when they left and the trays would later become collectibles. Þorvaldur’s interest in art accompanied him in all his affairs. He wanted to put up exhibitions in the National Theatre bar and chose works by Jón Engilberts for the first exhibition. A few days after the exhibition opened a representative from the theatre approached Þorvaldur who had neglected to get permission for the exhibition. He was kindly asked to remove the exhibition since the imagery was considered to lascivious for a respectable national theatre. Although Þorvaldur was disappointed, he and Jón Engilberts were also slightly amused by what they called “The National Theatre’s Impotence”. This was Þorvaldur’s last effort to adorn the National Theatre with Icelandic art. Þorvaldur opened the club and restaurant Lídó and The Reykjavik Angling Club held their annual event there on opening night. A noticeable number of people were eager to attend the event, regardless of their angling enthusiasm or lack thereof. Guests were 453 and a four-course menu cost 100 króna per plate. Due to airports closing abroad, the restaurant’s cutlery almost didn’t make it in time, but luckily the “flying saucers” arrived the day before opening night. The Farmers Association of Iceland asked Þorvaldur to oversee constructions for a hotel and restaurant business in their headquarters in Reykjavík, that were being built at the time. Þorvaldur subsequently became hotel manager of Hotel Saga for two years after it opened in 1962 but the name Saga came from his wife Ingibjörg. It was the first time Þorvaldur tried his hand at running a hotel and there was no going back after that. A little later he built Hotel Holt, took part in running Hotel Valhalla at Þingvellir and in 1966 he assisted the founders of what is now the Icelandair Hotel Reykjavík Natura in getting their new hotel up and running. Hotel Holt opened on February 12th 1965 after only 9 months of construction. In the beginning there were 30 rooms in the building, designed by architect Gunnlaugur Pálsson and State Architect Hörður Bjarnason. Þorvaldur hired interior designer Gunnar Magnússon to design the hotel’s style, interiors and furniture, Gunnar being one of Iceland’s pioneers in furniture and interior design in the 20th century. In an article in Morgunblaðið newspaper a journalist describes his visit to Hotel Holt and is obviously very impressed. “Icelandic art adorns the hotel walls at every turn and the place is equipped with first-class amenities.” Hotel Holt combined Þorvaldur’s two passions: collecting art and running hotels. you have but to request it. Þorvaldur Guðmundsson was asked to plan the final party of the World Chess Championship final match between Bobby Fisher and Boris Spassky, commonly referred to as “The Match of the Century”. The banquet was held in Laugardalshöll for 1,000-1,500 people and the menu included Icelandic lamb and suckling pig from Þorvaldur’s pig farm. Planning the banquet took two months and no expense was spared. Guests were served “Viking Blood”, mead brewed specially for the event and the staff wore Viking clothes and helmets. Custom-made cutlery and drinking horns were imported for the occasion and guests were invited to keep them after the party. The event was a huge success and aptly named “The Banquet of the Century”! A new wing was added to the hotel and opened in April 1973. The new addition increased the number of rooms to 53. Thingholt was opened on the ground floor of the new wing, a private function room with classical English style interiors designed by furniture and interior designer Gunnar Magnússon. The outside entrance to Thingholt is adorned with the elegant piece Asgard by sculptor Ragnar Kjartansson (1923-1988), inspired by Norse mythology. Odin rides Sleipnir, ravens Huginn and Muninn lead the way. Wolves Geri, Freki and Breki follow. Einherjar, Odin’s chosen ones, accompany him. Thor waits for them at Þrúðvangur with his hammer. There are two other reliefs by Ragnar in the hotel. They are in the hotel’s upper floors and depict Icelandic industries: fishery and commerce. Þorvaldur and Ingibjörg buy Lífshlaupið / Course of Life by Jóhannes S. Kjarval, a piece he painted on the walls of his study on the top floor in Austurstræti 12 between 1929 and 1933. The imagery is everyday life, Icelandic industries both urban and rural. A part of the piece is on display in the Thingholt bar. Olav V, King of Norway, came to Iceland in the autumn of 1988 on a state visit. He hosted a party at Hotel Holt in honour of Vigdís Finnbogadóttir, Iceland’s President at the time. Hotel Holt has belonged to the same family from the very beginning. Geirlaug Þorvaldsdóttir, Ingibjörg and Þorvaldur’s oldest daughter, bought her siblings’ shares in 2004 and has run the hotel since 2011. Gallery Restaurant was the in-house restaurant at Hotel Holt for many years. It was run by father and son Eiríkur Ingi Friðgeirsson and Friðgeir Ingi Eiríksson. Classical French cuisine was a prominent feature in this restaurant. Some of the restaurant industry’s most prominent professionals came from this restaurant, both chefs and waiters, many of them award-winning experts. 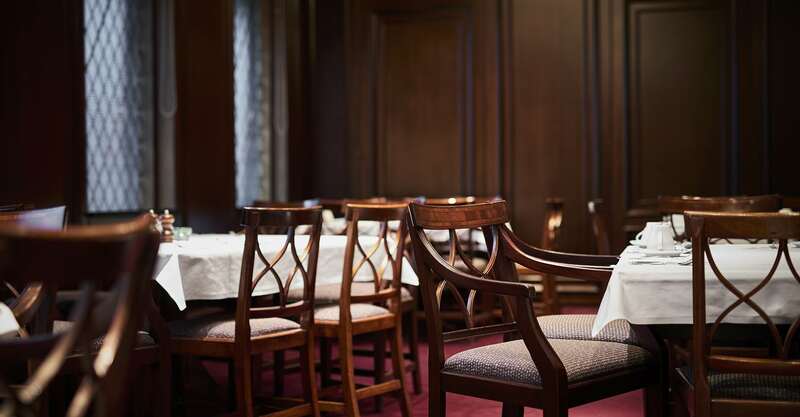 At the current in-house restaurant, Holt Restaurant, we continue the tradition of excellent food and service our guests have come to know and expect. On December 31st 2012 the hotel’s ground floor received a protected status. That entails that the interiors can neither be changed nor removed. The interiors were designed by furniture and interior designer Gunnar Magnússon and are both well made and beautiful. An exhibition on self-portraits by artist Ragnar Kjartansson (born 1976) opened in Hotel Holt in the spring of 2013 as part of Sequences Art Festival. Ragnar painted these portraits while staying in Hotel Holt’s suite 413 and the paintings were then arranged among the works of renowned Icelandic painters in the hotel. For the occasion of Hotel Holt’s 50th anniversary, Gísli B. Björnsson, who designed the hotel’s original logo, was asked to dress it up. A party was held to mark the occasion where popular dishes from the hotel’s past, such as lamb and gravlax, were on the menu. Diddú, one of Iceland’s most popular singers, sang at the party. Prince Joachim of Denmark and Princess Marie visited Iceland in early 2016 for the occasion of the 100th anniversary of the Dansk-Islandsk Samfund (Danish-Icelandic Association) and stayed at Hotel Holt during their visit. The association held a celebratory dinner for the royal couple and Icelandic authorities at the hotel’s Gallery Restaurant.